Thick-cut bacon is spread with brown sugar, red pepper flakes and ground mace before taking a long sauna in a low temperature oven. 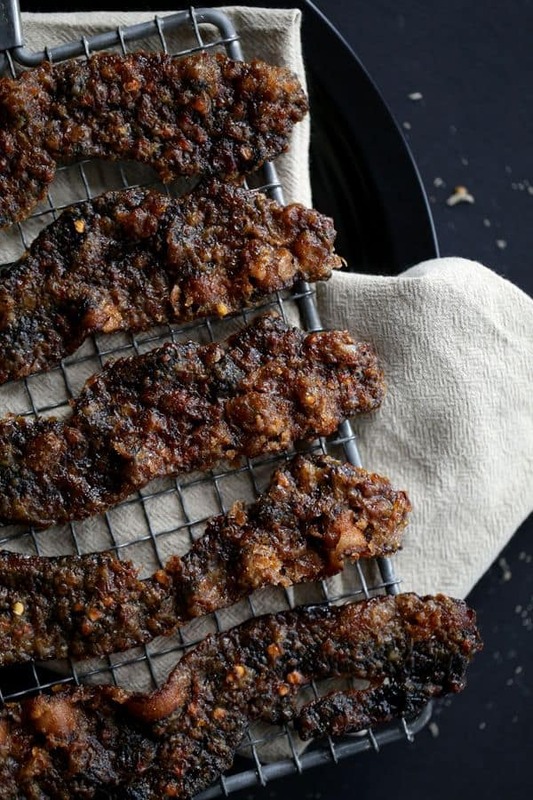 The sticky, spicy, sweet slices of Slow Candied Bacon that emerge are nothing short of addicting. January mail just isn’t as fun to get as December mail. In December, I eagerly await the sound of mail hitting our entry floor as it slides through our mail slot and rush to see if we’ve received any holiday cards. I love seeing photos of our family and friends that live all around the country but especially love those that include a letter with tidbits of what the family has been up to for the past year. It’s like old fashion Facebook of sorts for those of us that don’t use Facebook. The sad news? Of the 81 cards we received – yes, I counted them yesterday before recycling them – only five contained a letter. Wah, wah. But of those letters, I can always count on the card sent by Andy’s Aunt Joan to include a recipe. Such a clever idea. In fact, when she and Uncle Bob visited in November, she told me about “the best appetizer ever.” Said appetizer just happened to be the recipe included in this year’s Christmas letter. Slow. Candied. Bacon. I mean, was there any doubt that I’d be giving this a try? Nope! Thick-cut bacon is spread with brown sugar, red pepper flakes and ground mace before taking a long sauna in a low temperature oven. The sticky, spicy, sweet slices that emerge are nothing short of addicting. 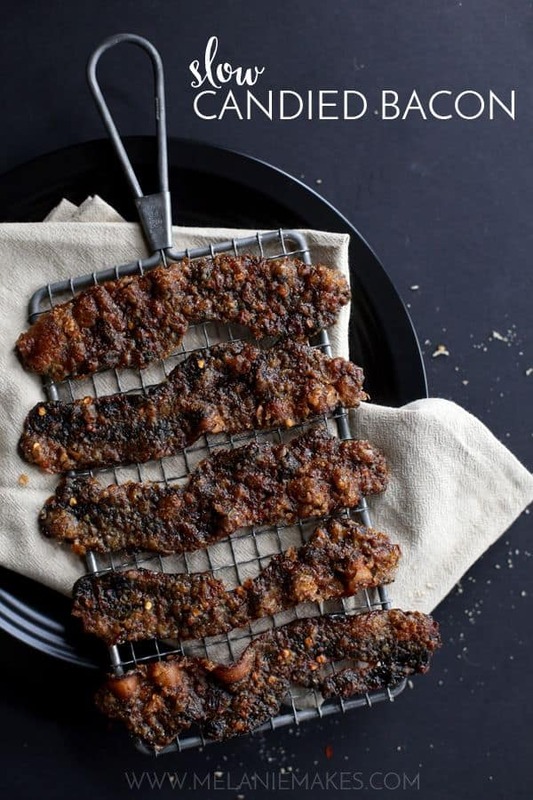 This Slow Candied Bacon is perfect as a snack or appetizer. 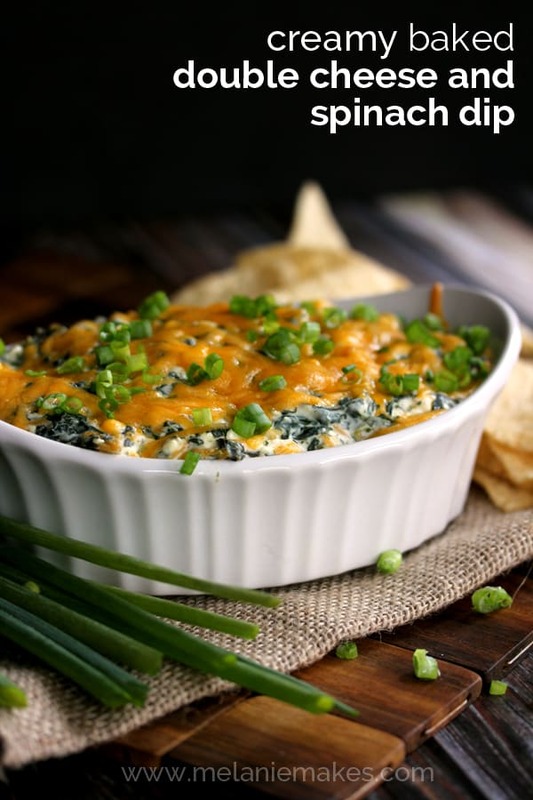 Can you think of a more perfect gameday bite to nosh on? A quick note about mace, as if you’re like me, it’s not something that is already in your spice arsenal. Mace is similar to nutmeg as it comes from the same large tree but comes from the dried covering that covers the nutmeg seed. 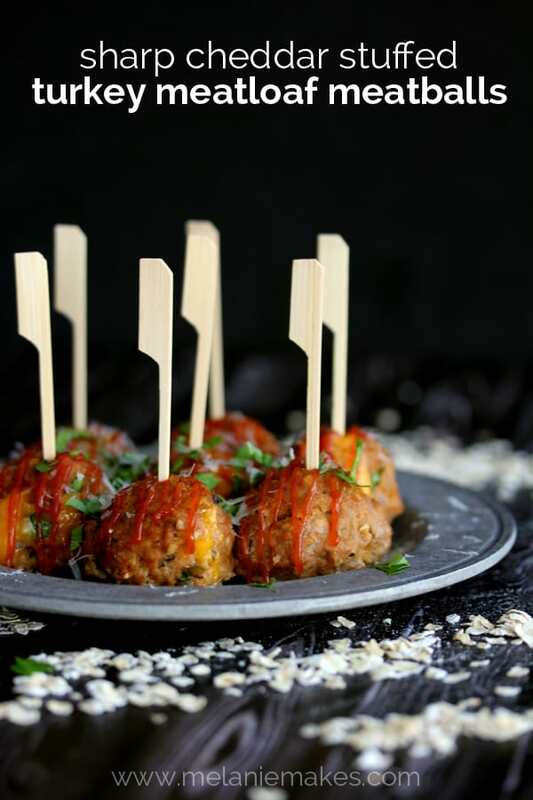 Mace tends to be a bit sweeter than nutmeg, however, which makes it the perfect choice for this recipe and also lends it’s warmth to this snack as well. Definitely worth a trip to the spice aisle on your next grocery run! In a small bowl, whisk together brown sugar, red pepper flakes and mace. 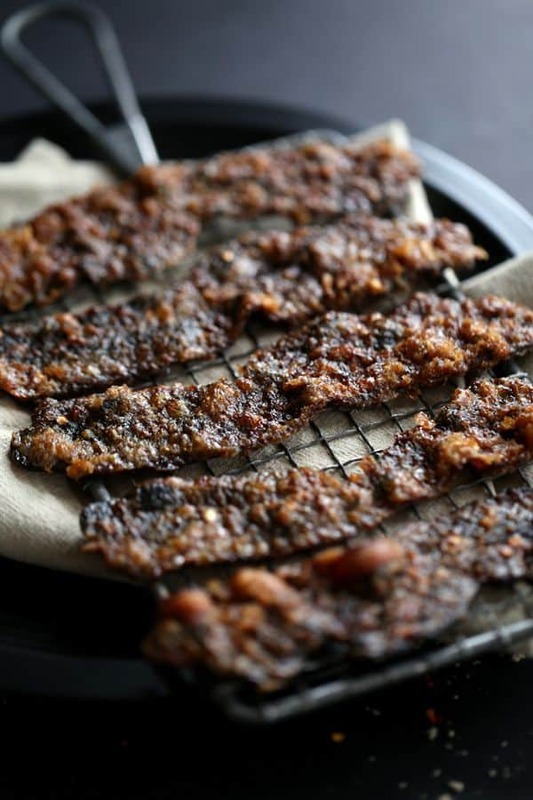 Arrange bacon slices on a rimmed baking sheet lined with parchment paper. The slices may touch but should NOT overlap. Spread brown sugar mixture evenly over bacon slices. Allow bacon to cool for five minutes before moving to a cooling rack to cool completely. If not serving immediately, bacon should be stored in air tight container between parchment paper. You need to do something for me. 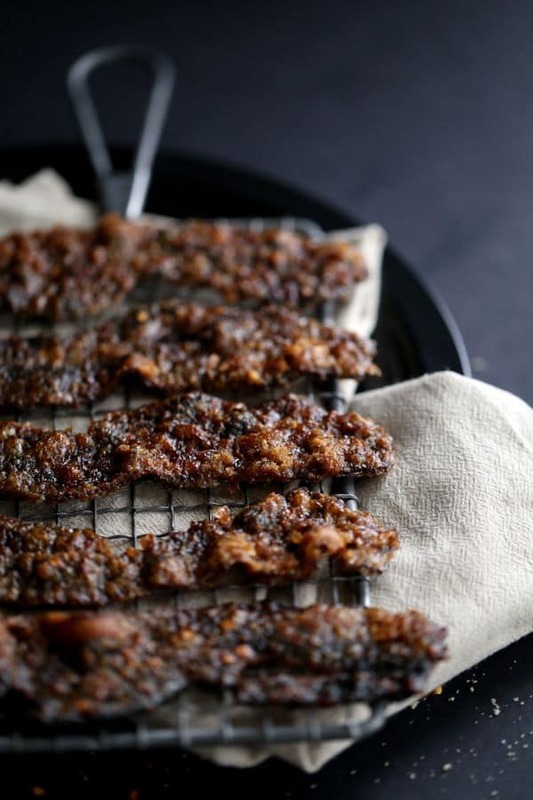 Make this Slow Candied Bacon and double the recipe. It’ll be love at first slice and then you’ll find yourself lamenting the fact that only a few slices remain and, in theory, you should be sharing with those around you. Consider yourself warned. My. My. My. Honey and Birch linked thi as and I think I've found another slice of heaven. Thank yiu! Thank YOU, Sarah! Beware though, this stuff is addictive! I always love it when people take time out of their life to write a letter. It means SO much! BTW this recipe is soon to be a favorite at my house — we love bacon and I can't wait to try it! I absolutely agree, Lauren - LOVE cards with letters! Let me know if you give the bacon a try! This looks SO good! 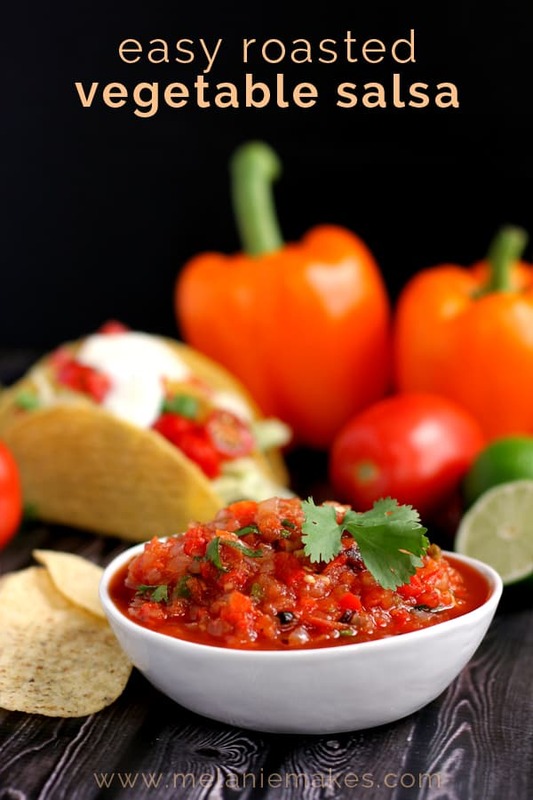 I love the sweet and spicy combo! Thanks, Jennifer - and yes, those red pepper flakes just make all the flavors pop! Oh you are speaking my language! You can't go wrong with these ingredients together on top of bacon! Yum! This takes bacon to the next level!!! Thank you, Nicole - it definitely has been a hit at our house! Nutmeg is one of my favorite spices, I've never used mace before though! I'm going to pick it up next time I'm shopping! I could eat a lot of bacon this way!!! Yum! I like how it's done in the oven, so there's less mess! Absolutely, Lise! And it's so easy to just put it in and then forget about it for a couple of hours while it does it's own thing and makes your house smell divine! We make candied bacon a lot over here, but I've never added crushed red pepper flakes. YUMMMM - I now know what I'm making today! You're so kind, Jenny - thank you! Mmmmm... I LOVE candied bacon! I'll have to try this, I normally do it on the stove! I bet you'd like this approach, Michelle - so easy and hands off! Ok, I love the idea of a recipe with our Christmas card. My husband forces me to write a letter each year; either letter or no cards get sent out. So I may be stealing this idea next year!! And this bacon....yes! I love that your husband sticks to his guns! I actually have a binder with every one of our holiday letters in it - got the idea from my mother-in-law. I say put one of your recipes in next year's letter - share that talent! mmmnnn I love candied bacon! I love that you used red pepper flakes. Andy's Aunt is a smart lady! What a fun idea to include a recipe in a Christmas card!!! If I ever get around to holiday cards that will so be happening :) This bacon looks Ah-maz-ing!!! You're the best, Karen - thank you! Totally agree, Deseree! Long live Christmas letters! This bacon sounds Heavenly! I love getting mail in December too - watching families grow year to year. That idea of including a recipe sound like so much fun! Thank you so much, Terri! I could eat that bacon all day long and pretty much could put it on everything. And I did put it on something! You should check out the tacos I just posted that they made their way on to - a perfect compliment! I like how you think, Heather!